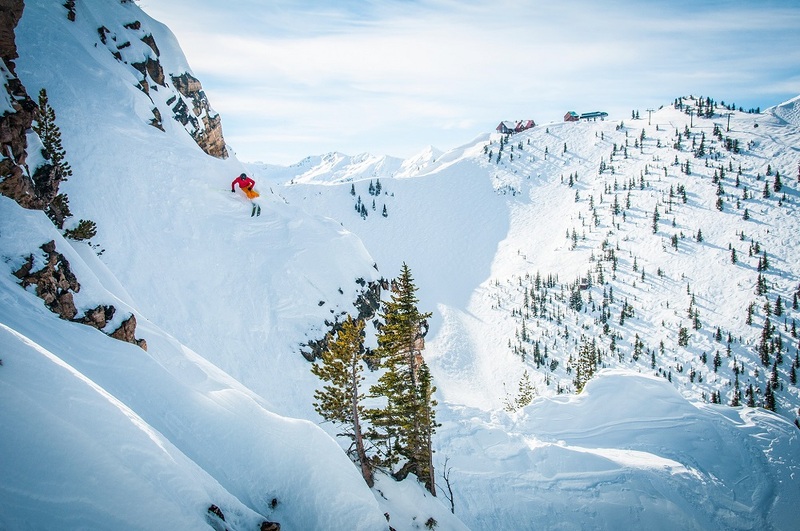 How do you Fly with Skis or a Snowboard? Flying with skis and snowboards is easier than it may seem. Most airlines allow you to check a ski or snowboard bag as one normal sized bag. Traveling with a ski or snowboard specific bag makes traveling and checking your bag much easier. Some airlines do have specific rules you need to follow, however. So, we know it’s possible to easily fly with skis and snowboards, but how do you make it as easy as possible? 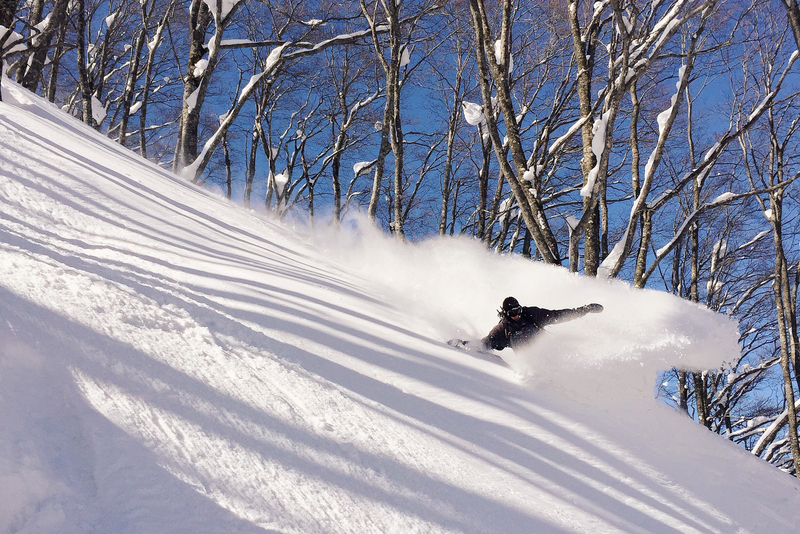 Here at evo we’ve traveled the globe from Japan to Chile with our skis and boards, follow along and we’ll fill you in on the tips and tricks we’ve learned. Travelling with ski and snowboard gear can definitely be stressful, but with proper planning and some inside tips, you can be flying with your skis and snowboards like a seasoned pro. Compared to traditional luggage skis and snowboards are heavy and awkward. The first step to getting your skis and snowboards on the airplane is getting your baggage setup dialled in. With the proper luggage you and your gear will breeze through the airport with ease. We believe that a wheeled ski bag or snowboard bag is the best. Not only do wheeled bags make it exponentially easier to traverse airports, but they also tend to have extra room to pack your other miscellaneous ski and snowboard gear for airline travel(i.e. boots, outerwear, poles, etc.). For skiers, we recommend a double ski-roller bag.The bigger ski bag allows you to pack bulky items like outerwear, gloves, and clothes. 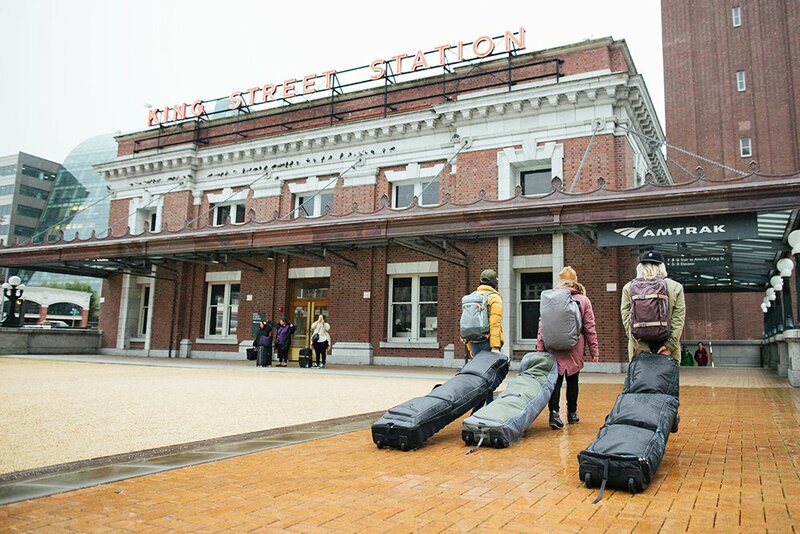 Most skiers at evo will travel with only their ski bag and a backpack, fitting all of their clothes in a big double bag is not only more efficient, but it also provides additional padding for your gear. 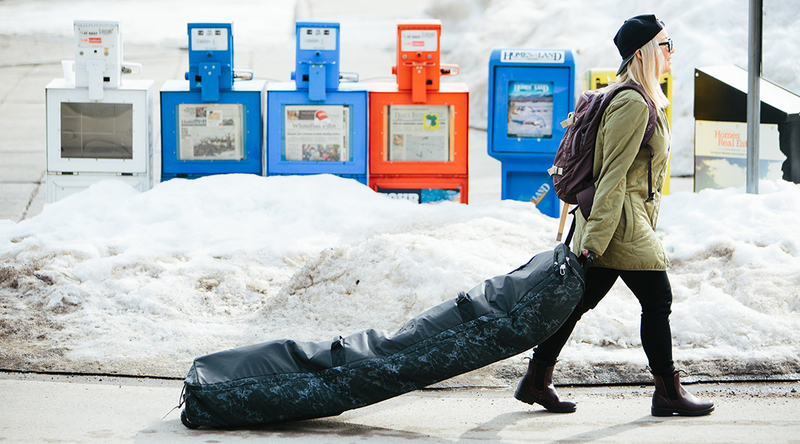 For snowboarders, roller bags are also nice, as they are generally larger and more convenient. They allow you to pack more clothes and other gear along with your snowboard with the extra room. Some ski and snowboard bags also have special compartments for boots, read on and we’ll share some best practices for traveling with ski and snowboard boots. Many airlines’ ski and snowboard baggage policies will check a ski or snowboard bag AND a boot bag as one checked bag. Packing in a ski or snowboard boot bag can be super convenient for air travel, and save you money. However, in the event that your baggage doesn’t make it to your destination, boots are much harder to rent than skis or a snowboard, especially ones that are custom molded to your feet. This is why many skiers and snowboarders will bring their boots with them on the airplane as carry on luggage. Velcro the powerstraps together, or tie the laces together, and thrown them over your carry-on. This way, your ski and snowboard boots are certain to fly with you to your destination. If you’re not as worried about the airlines bungling your baggage, a boot bag is a great convenience, letting you keep all of your ski gear separate and organized. Boots are also a bit awkward to handle in the tight isle of the airplane. 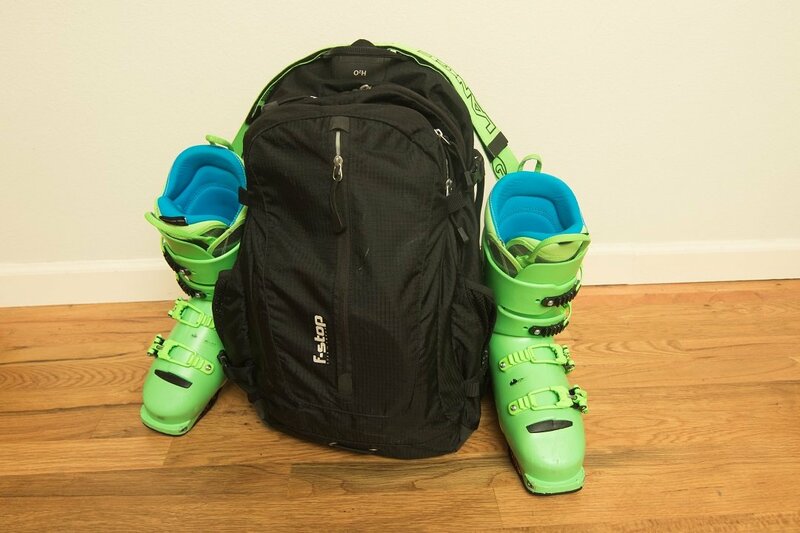 If you are going to carry your ski or snowboard boots on, we recommend taking them off of your backpack when on the airplane, so you don’t hit any seated passengers on your way down the aisle. In addition to your ski or snowboard bag, a backpack is a great piece of luggage for ski and snowboard trips. We love flying with ski and snowboard backpacks that have helmet carrying systems, because your helmet can easily get damaged or ruined in other luggage. Additionally, backpacks are a great place to stow smaller items and electronics that might get lost or damaged in your checked board bag. 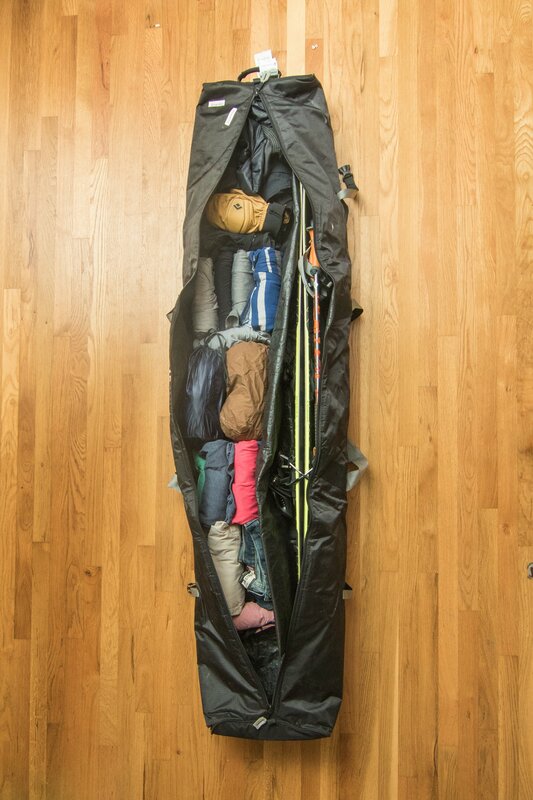 This is our favorite way to pack your skis or snowboard for airline travel, it’s simple, you have less bags to juggle, and you can avoid checking more than one bag, which is becoming more and more expensive depending on your airline’s ski and snowboard baggage policy. 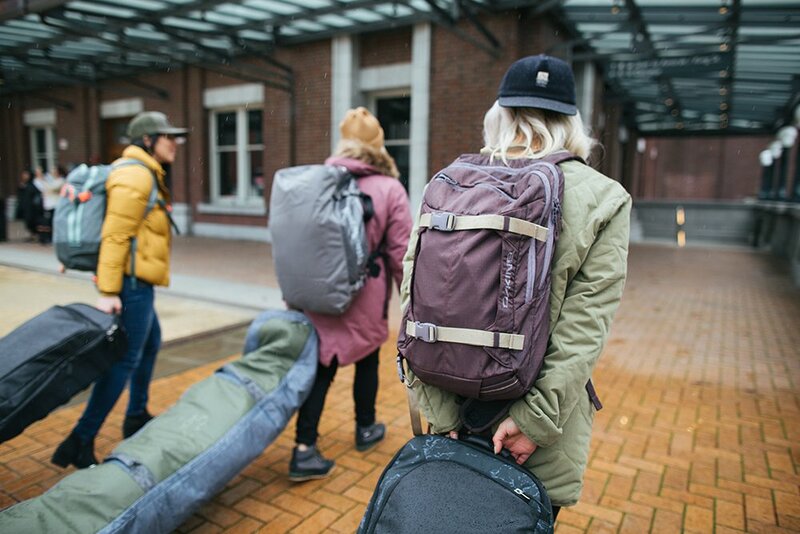 Packing all of your clothes, and gear in one bag takes some organizational skills, however, we think it’s well worth it. For traveling skiers and snowboarders that value the organization of a traditional suitcase, or those who can’t fit everything into their ski or snowboard bag, an additional suitcase might be necessary. This will make airport travel a bit more involved, but you’ll have plenty of space for both ski and snowboard gear as well as street clothes. Although typically more expensive than checking your bags through the airline, some people prefer to ship their gear in advance so that they don’t have to navigate the airport with anything other than a single, lightweight carry-on. If airports stress you out, this can make traveling with ski/snowboard gear a whole lot less traumatic of an experience. Roll Up Your Clothes & Layers: Rolling your clothes into nice little burritos helps organize in a ski or snowboard bag because you have lots of vertical space, unlike a traditional suitcase where folding and stacking may be ideal. Use Stuff Sacks: Using a stuff sack for items like socks and underwear is also a great way to stay organized, and to keep track of these smaller items when travelling. Plus, once certain garments get dirty, you can keep them separated by shoving them in a stuff sack. 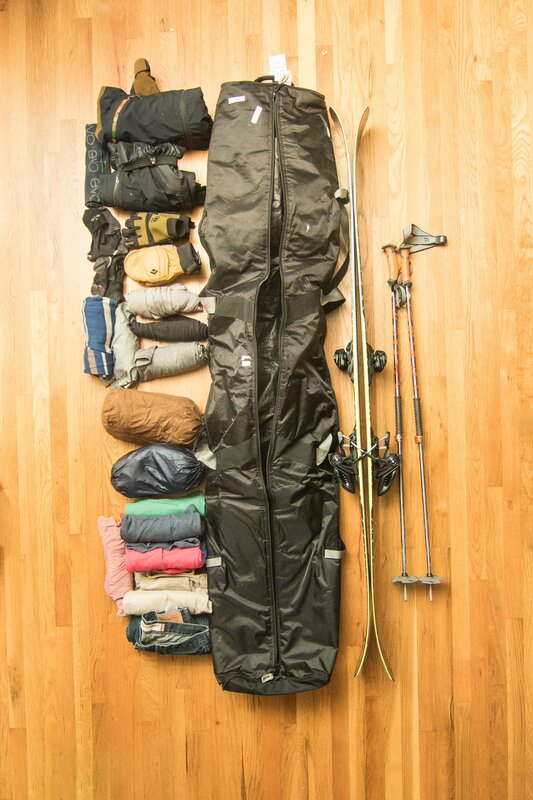 Skis on One Side, Clothes on the Other: Imagine drawing a line vertically down the middle of your bag, skis, poles, avalanche gear, etc. goes on one side, clothes on the other. Each airline has a different policy for ski and snowboard bags. In most cases, airlines treat a ski or snowboard bag as on normal - not oversize - bag. Sometimes they count a ski bag and a boot bag together as one bag, too. Important Note: This list may not be up to date. Always check directly with your airline about the most recent baggage policy for your specific flight. Skis or snowboards are subject to normal checked baggage fees under Alaska Airlines’ ski and snowboard baggage policy. Oversize and overweight fees are waived. They do not specify whether boot bags are included. American Airlines’ ski and snowboard luggage policy counts a ski or snowboard bag AND a boot bag as one regular checked bag. The policy specifies that items other than boots, helmets, and bindings are not allowed in the boot bag, or travelers will be charged for an additional bag. Delta Airlines’ ski and snowboard policy allows travelers one ski or snowboard bag, and one boot bag as a single checked bag. If the combined weight of these two bags exceeds 50 pounds, there will be an excess weight fee. Frontier Airlines’ ski and snowboard baggage policy counts a ski or snowboard bag and boot bag as one checked bag, unless the boot bag weighs more than 25 pounds. If this is the case, the bags are counted as two items. Overweight charges over 50 pounds still apply, too. Again, according to Southwest Airlines’ ski and snowboard baggage policy, a ski or snowboard bag AND a boot bag qualify as one checked bag. No excess size charges will be applied, but the bags are still eligible for excess weight charges. United Airlines’ ski and snowboard baggage rules count ski or snowboard bags AND boot bags as one checked bag. Normal baggage fees apply, as well as excess weight fees if the bags weigh more than 50 pounds in total.